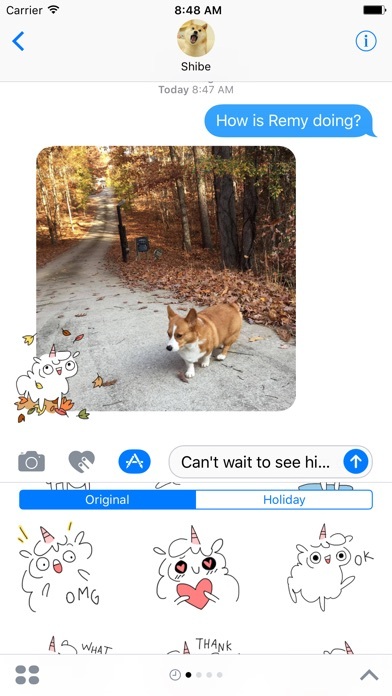 Fluffcorn is a bundle of magical goodness that is ready to make your messaging experience 100% cuter. Art drawn by Alisha Liu (alishaliu.com). 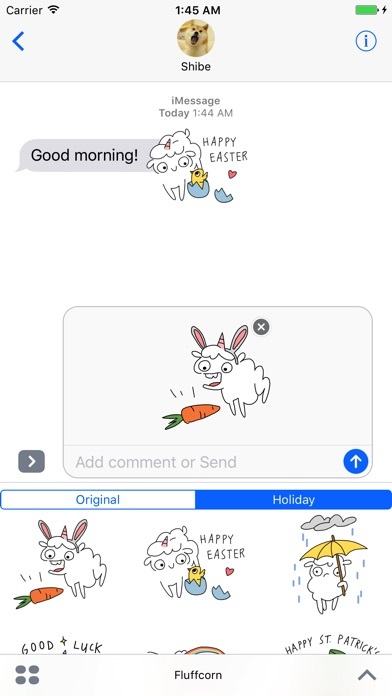 Fluffcorn sticker app's code available open source (github.com/fluffcorn). Release Notes: Updated performance monitoring code to keep Fluffcorn crash free. 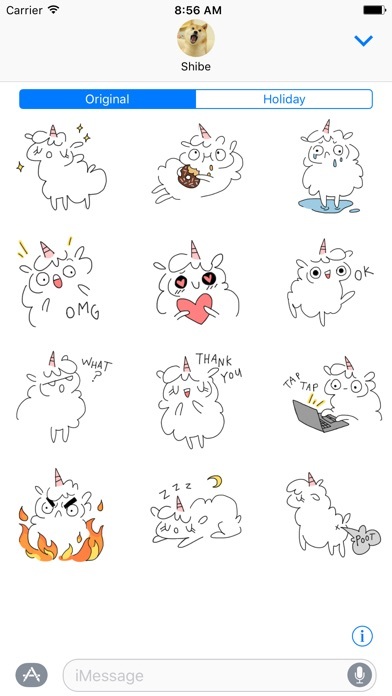 The fluffcorn stickers are cute, derpy, and 100% free. They deserve their very high ratings and I recommend them. I use these all the time but I need more/ would love more! By far these are my favorite stickers!! Super cute and adorable. I do wish they made more stickers!!! My favorite sticker is the mad one with flames, reminds me of me. My bff laughs at it every time she see it. Thank you so much but please make mire!! Make more of them please!!! Using these stickers... to the point that my boyfriend had to do a sticker intervention. I love these sooo much, they’re adorable, it’s a must have! Seriously, just download. I seriously love these stickers. Super cute and super me! 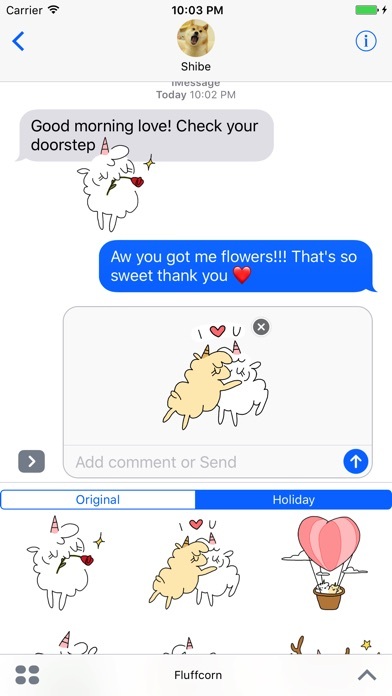 Just sending them to family and friends make me giddy. 😊😊😊 Hopefully more in the future. I love these stickers!! I just wish there were more of them in general and for other holidays! These fluffcorns make me meme. I love them more than dat boi. These are my favorite stickers ever! They are super cute and I love the art style!! 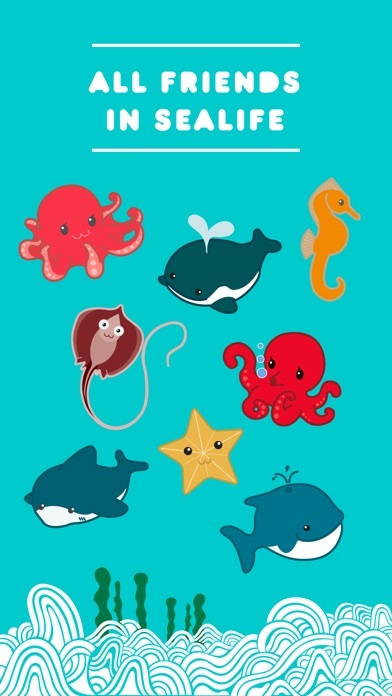 Super cute stickers. Great illustrations. 😁✌🏼 Thank you! It's my life now. I use these stickers constantly. My text conversations now solely consist of these stickers. It's making communication more difficult but much more pleasing to look at. Who cares if I never text another word again! Super cute stickers, but there's such limited selection. Only 12 original stickers and 15 holiday stickers to choose from. These stickers changed my life. I've recommended them to all my friends. 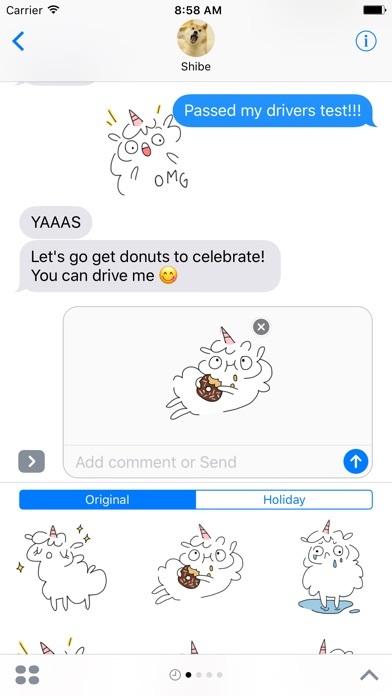 I littered all my text messages with them, and while at first my friends were annoyed, they couldn't resist how adorable the fluffcorns are. Even if these were $5, I would pay for them without a second thought. I can't get enough! I can even send them to dumbphones. Who knew this would make me so happy? !